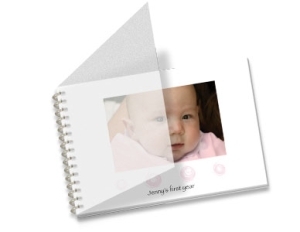 A personalized baby photo gift is a great gift as a keepsake to give at a baby shower or even after the baby is born. Need a cute baby shower gift? Nab a picture or two of the happy couple holding the baby belly together. If there are siblings take some pictures with the brother and/or sister touching, hugging, or holding the baby belly. Another very cute and whimsical idea is to encourage the baby mama to paint her belly and then take some pictures of it! When all else fails simply sneak away with a copy of the ultasound picture. Take it to a photo copy center and have a few high quality copies made of it and then safely return it as quietly as possible. Use the ultrasound picture to make a photo gift with by either sending it to an artist, having it framed, or scan it to a computer to have a digitally printed gift made. 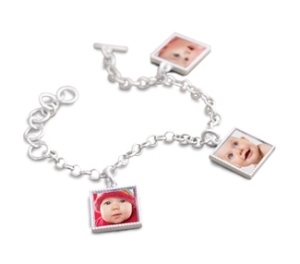 What mom would not want some jewelry personalized with a photo of her baby?! 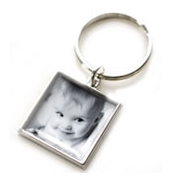 You can have jewelry made with pictures, and even engraved with names and dates! So sweet and beautiful! She will LOVE it! You can find some really great jewelry artists willing to make personalized baby photo gift jewelry for very affordable prices by shopping around ar Etsy.com. It is by far one of my favorite places to shop when searching for a unique gift item of any sort. I also really like the sterling silver custom jewelry you can order through Snapfish.com. The prices are good and the photos are made to be water resistant. They come in a gift box as well. If you are looking for something really breathtaking and special then definitely take a browse arund the personalized jewelry at Dimples and Dandelions. 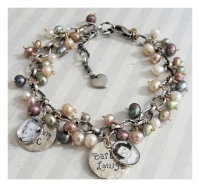 My personal favorite is their pearly photo charm bracelet. You can have up to 8 photos added. The bracelet is adorned with a multitude of fresh water pearls. Very pretty! Useful and cute. This is also a great gift to slip in with a diaper bag or baby carrier. I really like to get my keychains made from an artist at artfire.com who makes them from a barbell style keychain and will add a script message and even Swarovski crystals, for an extra fancy keychain. you can also find a more traditional and plain keychain at Snapfish.com. My favorite idea? Talk the expecting mom into taking monthly pictures of her belly from the side angle. Take them from very early on and up to the 9th month of pregnancy. Then make a calendar out of all of the pictures or a photo flip book of sorts! A seriously great gift! I like to use Snapfish.com to make my personalized calendars and photo books. They have a good selection of themes and colored backgrounds to use with your photos and the quality is great! 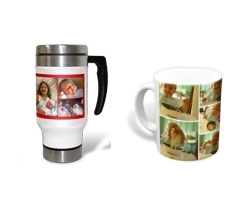 Have a mug personalized with baby belly or ultrasound pictures along with the due date. Very sweet gift and keepsake. I love to give these as gifts! I have been know to give these as baby gifts, but also get them made with my own kids pictures for our own cupboards and to give to family on holidays. So cute and very useful too! I buy my mugs at Snapfish.com. Remember not to wash them in the dishwasher though or they will fade over time.